Bennie’s story is one of perseverance despite tremendous obstacles. As the oldest of ten children, Bennie went to work on a Mississippi farm at the age of seven to help provide for his family. All too often, his father was too drunk to work, so it was up to Bennie to earn money. His younger siblings attended school while he worked, pulling in $1.25 a day – 50 cents of which went to the driver who took him to the farm and back. Bennie was 15 when he came to Wisconsin, after his father had moved north a few years earlier for work. Bennie’s well-meaning aunt enrolled him in school, but once again his desire to learn was thwarted; he was far behind his peers and placed in a grade with much younger children. Disheartened but ever determined, Bennie attempted to sneak into classes at North Division High School, but was soon discovered and ejected. Eventually Bennie signed up for Job Corps, a government-run technical training and education program for young people. He got a job in a foundry where he worked for more than 16 years. But when a promotion to foreman revealed his illiteracy, he lost his job and succumbed to alcohol and drug addiction. What followed were years of addiction, homelessness, job losses, health problems, and eventually jail time. In the months that followed, the probation officer treated Bennie strictly but fairly, sending him back to jail whenever he failed a drug test. The third time he was sent back, he pleaded for her help and swore to never use again. “I meant that from my heart,” said Bennie. “That’s how I quit. I said if she helped me get out I would not do it again. I didn’t do it any more. That was it.” He even gave up drinking beer for fear that he might lose control and pick up drugs again. Instead, he joined Alcoholics Anonymous and eight years into the program, he was running the meetings. After getting clean, Bennie knew it was time to follow his dream. 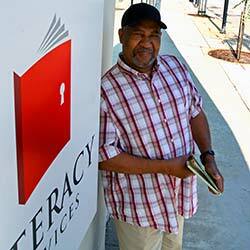 “Deep down in my heart,” Bennie said, “I wanted to learn to read and write. 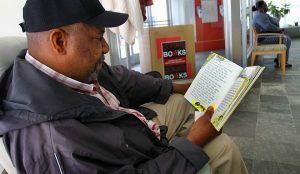 That was my goal.” His probation officer helped him enroll at Literacy Services of Wisconsin in 2002, where he found compassionate staff and patient tutors who helped him learn what had eluded him for most of his life. Bennie started the phonics program when it was introduced in 2008 and proved to be one of the most dedicated and diligent students, rarely missing a class despite numerous health complications. After several years of hard work and perseverance, Bennie completed the phonics program and began to work towards attaining his GED. Three days a week, Bennie arrives early for class and sits in the lobby, reading a book and happily greeting all who enter. When asked about his determination, he credits his tutors: “They make me want to be here.” The feeling is mutual, as students like Bennie inspire tutors and students alike to continue pursuing their goals.